Chris Millar has signed a new one-year contract at St Johnstone after deciding not to pursue a move to Australia. The 29-year-old rejected the offer of a two-year deal at Saints earlier this year and was considering seeking a move to a club in the A-League. 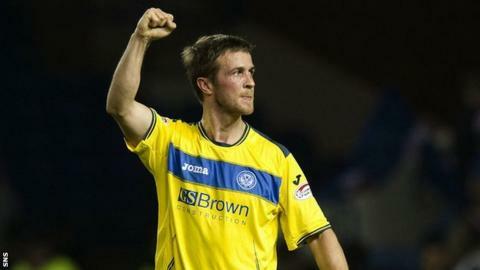 But the former Morton player has now agreed to spend a fifth year at McDiarmid Park. "I didn't want to leave but I did want to assess my options," Millar told the Perth club's website. "The gaffer [Steve Lomas] has been in touch with me regularly over the close season and has made it perfectly clear that I am very much part of his plans and being with a club that wants you means a lot to a footballer. "I'm looking forward to it now and hope I can contribute to the team's continued success. "We have Europe to look forward to - it's a tough draw but one we should all look forward to." St Johnstone have been second qualifying round. Eskisehirspor qualified after Besiktas were banned by Uefa from European competition because of financial issues. However, the Istanbul club have appealed to the Court of Arbitration for Sport, which has yet to issue a decision. If Besiktas are successful in challenging their punishment, Bursaspor, who themselves won an appeal against expulsion at CAS last week, would step in to Eskisehirspor's place.